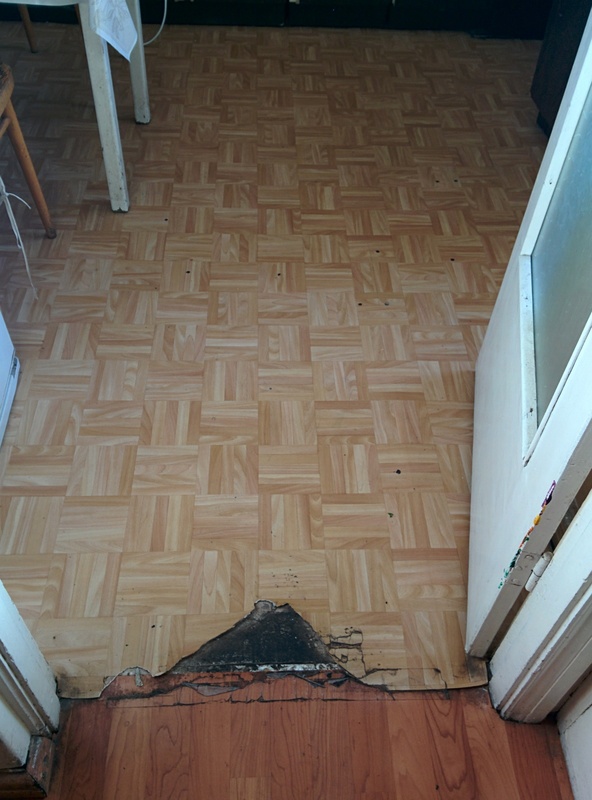 The paper-thin linoleum floors had finally given out in my rental apartment. The material was so flimsy that it could be torn effortlessly with bare hands. In some places the floor began to buckle or literally come loose at the seams — I had to keep the vinyl together using clear tape. And although the foyer and kitchen adjoined, the flooring in each didn’t match at all–completely different colors and patterns. 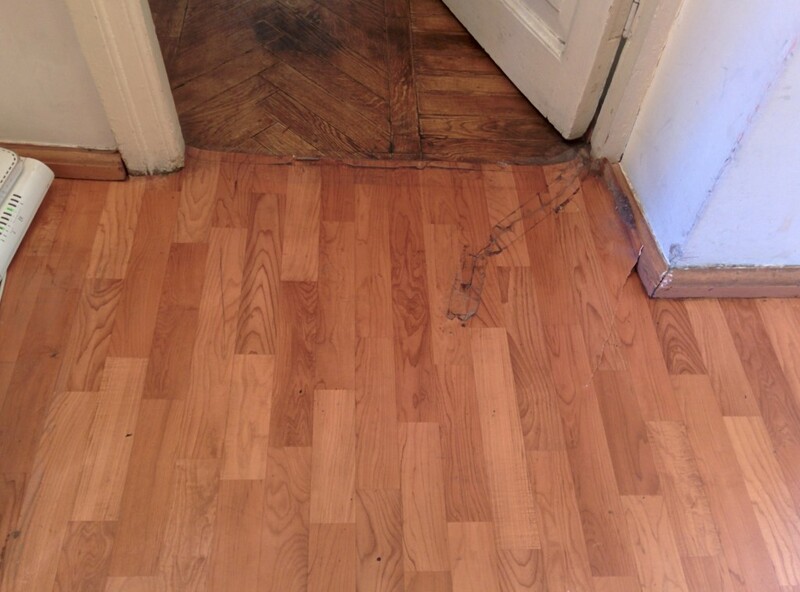 I discussed the possibility of changing the floors with my landlord in the spring of 2014 with no success — he refused to consider replacing the linoleum on the grounds that 2.5 meter wide flooring was no longer available on the market (not true), and that the kids would end up destroying the replaced floor anyway. 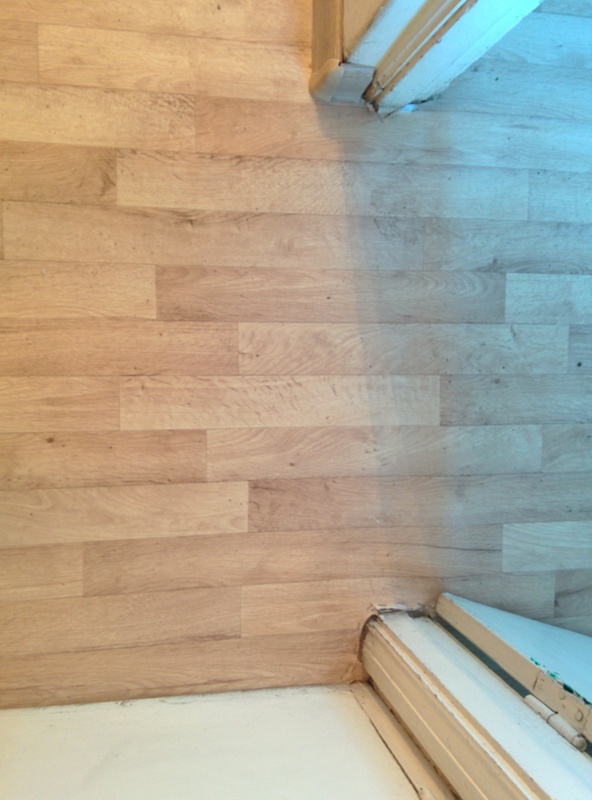 At the time I had the mindset that since the home wasn’t technically mine I would not pay to have the floor redone. 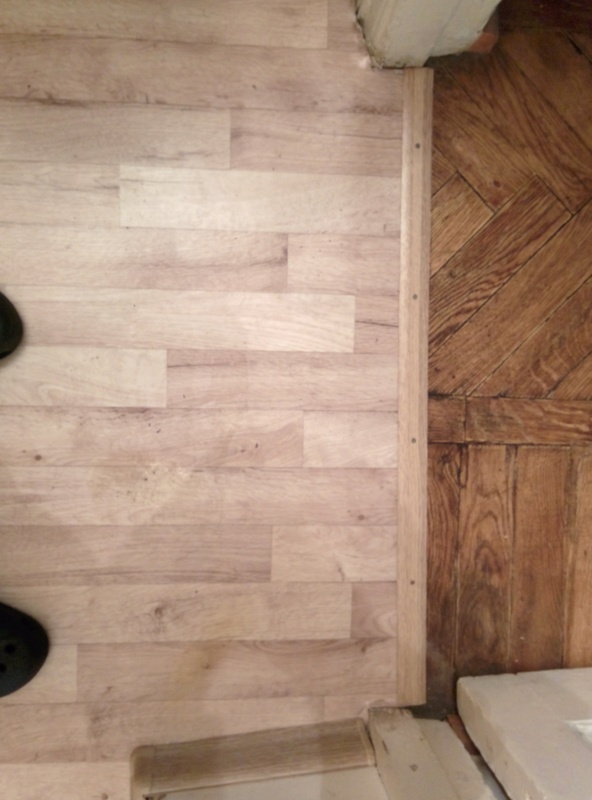 That was until a few weeks ago, when a corner of the floor came up after opening both the twin front doors. That was the last straw. It was time to go floor shopping. But before I could go anywhere upon recommendation I asked a flooring guy over to suggest options and give an estimate. His name is Edgar, and he recommended either ceramic tile or linoleum replacement. 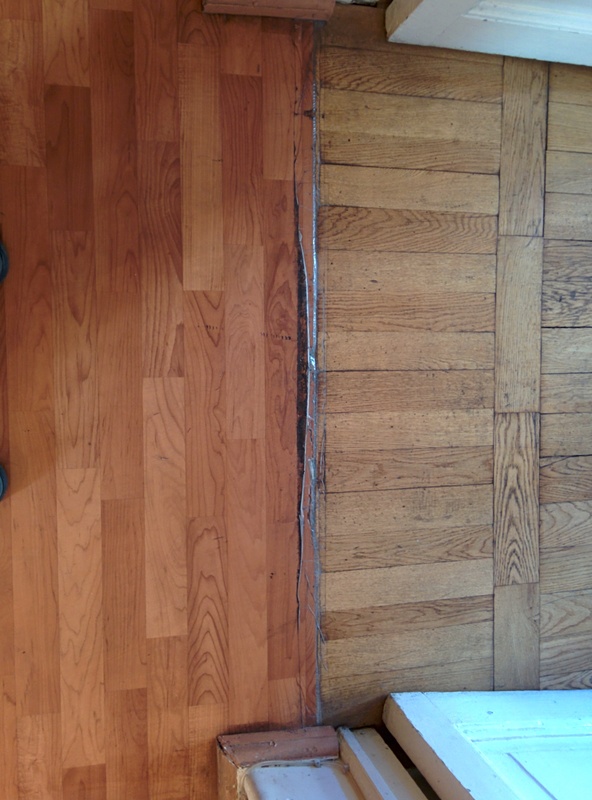 I chose the latter since the tile installation was not cost-effective plus the floors are actually uneven — there’s about a quarter inch step-up into the kitchen. I wasn’t about to pay umpteen dollars to even it all out. The challenge was finding the linoleum. I wanted a light color, similar to the faux parquet beige pattern that was in the kitchen (see photo). 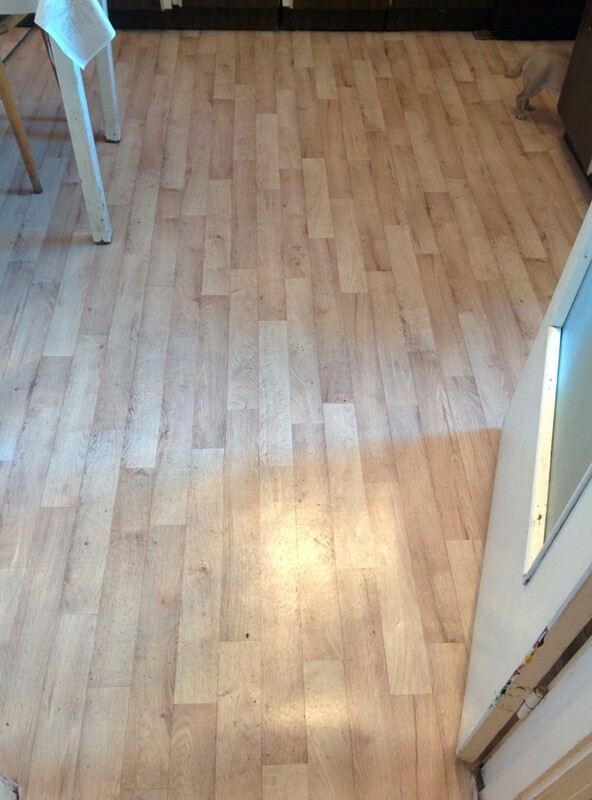 I decided to have the flooring installed last weekend, on Saturday. Edgar insisted that we could find something at the “Knuni” home improvement market right down the street from where I live, but we only found one store that didn’t have the required length of flooring we needed, which was 9 meters. Our trek on foot led us down to Nar-Dos Street, which proved fruitless. 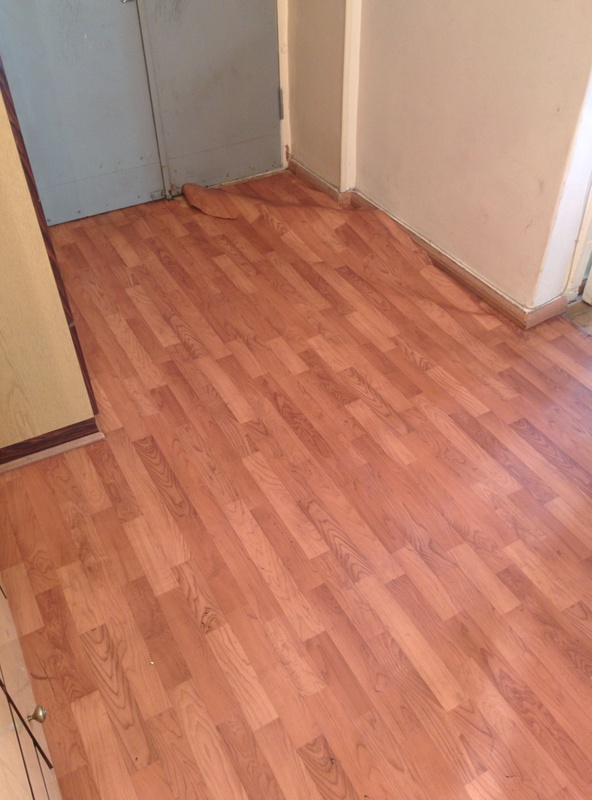 We only found stores specializing in wood or ceramic flooring. One shop keeper recommended that we visit some stores on Tigran Mets Street, on the block between Nar-Dos and Kristapor Streets. Some of these stores are known for selling low-grade Iranian and Turkish home goods, like plastic storage containers, rainbow-tinted feather dusters and flimsy aluminum cookware. But, as it turned out, there are shops that sell reams of flooring of all different shades and patterns. After visiting three stores I settled on a vinyl flooring with a cappuccino colored oak wood pattern. 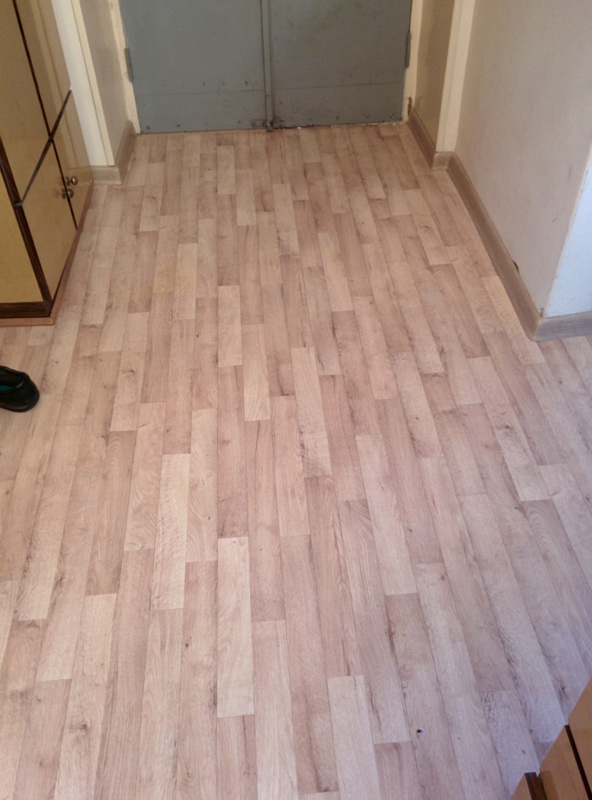 It was perfect — the required width of 2.5 meters, gorgeous pattern and over three-times thicker than the other flooring, which was put down as a fast and cheap short-term solution to begin with (at today’s rate, that junky flooring costs about 3,000 dram, or $6.20 a meter). 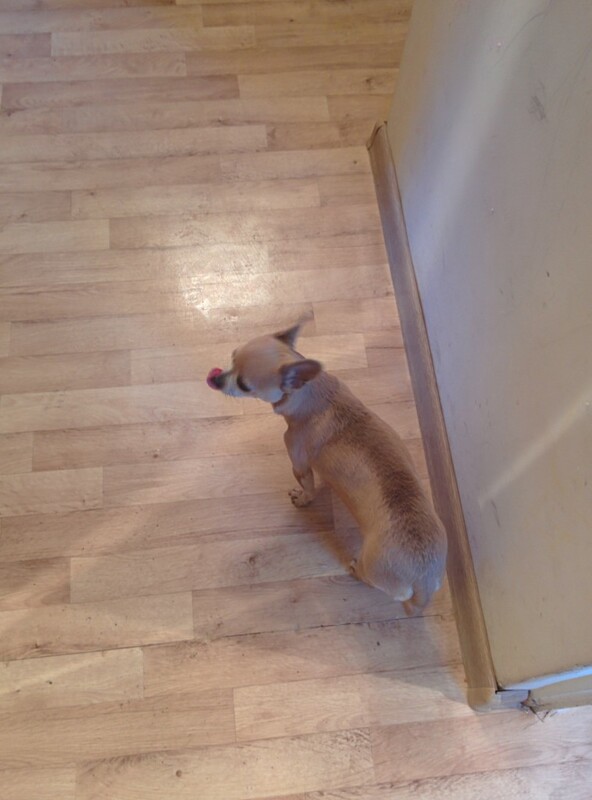 The flooring I chose was manufactured by a Slovenian company called Juteks and claimed to be doggie proof, meaning that I should’t have to worry about my pet Chihuahua having occasional (okay, daily) accidents. That set me back about 57,000 dram, or $118. I remember having to wait about five minutes for the shop owner to run about attempting to make change for 60,000 dram — he didn’t have three 1,000 dram notes to give back in the till (if one even existed). He ended up taking out the cash from his own wallet. Strange that literally nothing has changed in the last 15 years since I first stepped foot in Armenia with reliably and consistently having small change returned in a cash transaction. Somehow, it’s worse than ever. Next came the purchase of wall boards — the decorative band made from wood or vinyl that hugs the base of the walls where they meet the floor. We found a vinyl one that supposedly matched the color of the floor perfectly, but it was sitting in a warehouse nearby. But instead of picking the boards up in the store I actually bought them from, we were sent to a different store. It took 45 minutes for the boards to arrive, only to see that not only were they the wrong color, they were not produced by the same manufacturer and I had to get my money back, which meant a trek to the shop we were just in. That fiasco led us on another search inside the labrinth-like “Knuni” market, which is essentially rows and rows of merchants selling all sorts of hardware, from power tools to door locks to wrench sets. It turned out that most resellers all depended on the same distributor and would only offer us the very same wall boards that we rejected. Miraculously, we somehow found another seller that had his own inventory and he had exactly what I was looking for. Another visit to a warehouse kept us waiting an additional 20 minutes. Both of us were completely fed up at that point, and I promised I would buy anything the guy found in there, so long as it wasn’t blue. But Edgar refused to install the flooring that afternoon claiming that he wouldn’t have been able to finish by sundown had he started work at 12:30 pm when we returned home. I didn’t understand why that was so important to him, but the job was deferred to Sunday. I should emphasize that Edgar is great at what he does. He doesn’t have an excellent eye for detail and his logic for doing things, like stapling seams together instead of using an adhesive, was a bit odd. Luckily, a friend lent me some nail polish that perfectly matches the floor shade so I’ve been successful in concealing the staples. Now I have to be extra careful about where I step since my dog is bizarrely perfectly camouflaged. I didn’t realize she would blend right into the floor until she took her first few trepidatious steps on the virgin surface. She took a pee a couple minutes later.